← KERRY HOTEL, PUDONG, SHANGHAI Hotel Pool Takeover! Singapore’s 10 most impressive hotel pools: Singapore Business Review worked with trivago.sg to put together a list of ten of the most impressive hotel swimming pools in Singapore. There’s a slideshow that of course starts with Marina Bay Sands. There are some other interesting pools as well, including Westin Singapore’s roof top infinity pool which looks unique. San Diego’s 5 most amazing hotel pools: Fox News web site compiled their list of the best pools in the San Diego area, pointing out that in San Diego, warm weather (and heated pools) extend pool season quite a bit in this area. We’ve covered most of these pools before, but definitely want to check out Paradise Point after reading about it here. This makes us very happy. 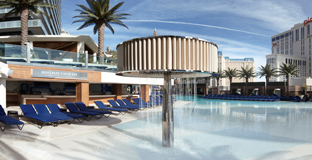 The Cosmopolitan in Las Vegas is converting its Boulevard pool into an ice rink, November 24th through January 5th. We wrote about a pool doing this once before, but never actually confirmed it was real. According to this piece at Netglobers.com, “In addition to an expanded skating area, the rink will host date nights featuring timeless holiday movies, such as “White Christmas” and “A Christmas Story,” as well as a full bar stocked with holiday-themed cocktails.” Cool! Here’s the pool pre-rink…hard to imagine it on ice!